After a successful preview program, we are happy to report that the first release of the OneDrive for Business Next Generation Sync Client is now available for deployment. Our top priorities for this release have been improved reliability and performance as well as providing essential user capabilities such as selective sync, support for large files up to 10 GB in size and removing the 20,000 file sync limit. 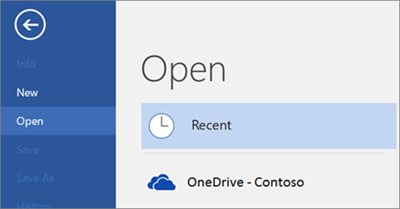 The OneDrive for Business Next Generation Sync Client is available for Windows 7, Windows 8, and Windows 10 (Windows 8.1 support will be added in the first quarter of 2016), and for Mac OS X 10.9 and above. IT administrators can deploy the client with configurable options such as the ability to block sync for the OneDrive consumer service as well as set the default sync folder location. Updates to the new sync client will occur independently of Office and Windows updates. There are some aspects of this first release that you should be aware of. We are shipping with some notable gaps that you should review before determining whether this new client is currently appropriate to deploy to your organization. Windows 8.1 support: This release is currently not supported on Windows 8.1, this support is planned for early 2016. SharePoint Document Library sync: This capability will be added in future releases; we will communicate timelines for this support in the first quarter of 2016. The Next Generation Sync Client will work side by side with the existing sync client (groove.exe) for customers who require sync for both OneDrive for Business and SharePoint document libraries. The user can’t participate in a co-authoring session on the document. The Most Recently Used (MRU) list is updated with the local path to the document, not the cloud location. So if the user also opens the document from the browser, they will have two listings in their MRU with the same filename. Sharing via OneDrive for Business from the backstage of the Office app is not available. Cloud (Modern) attachments are not available in Outlook 2016 because it thinks that the attachment is a locally stored file versus a OneDrive for Business cloud file. The File-Open experience inside the Office app. Limitations in transitioning from the existing sync client: If your organization is currently using the existing sync client, there is currently no automated, in-place takeover or migration of content to the Next Generation Sync Client. This will be added in the first quarter of 2016. 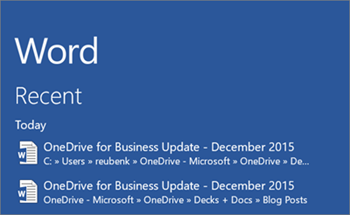 For full details see Transition from the existing OneDrive for Business sync client.